Seeing how I spend my family’s disposable income on race fees and pink running dresses, my frivolous beautification budget is typically somewhere between $0 and $50. A year. 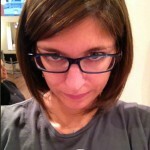 So when Di Petro Todd salon says to me, Would you like us to highlight your hair for free… who am I to say no? OK, that’s not really how it happened, but the result (highlights) and cost (free) is pretty much it. When we moved to the Bay Area I struggled to find a good hair stylist for a while. Many a bad hair days were had. Finally, at the recommendation of a coworker, I booked a date with Fernando at Di Pietro Todd in Palo Alto and I swear, me and my hair will be faithful to his scissors for life! Then I found out about Di Pietro Todd Academy in San Francisco, where they teach all sorts of classes, including color/ highlights. They need hair models, and you don’t even have to be 6’3″ and 95 pounds to be one! What’s the catch, you ask? There isn’t one. The stylists who sign up for these classes are all skilled practicing professionals; they’ve paid a lot of money to learn new highlighting (or color, or cut) techniques and all they need is you to sit and be their “live” model for about three to five hours on a Sunday afternoon. Why yes, I would absolutely love to spend my Sunday afternoon sitting in a chair at a high-end salon instead of hanging at a playground. 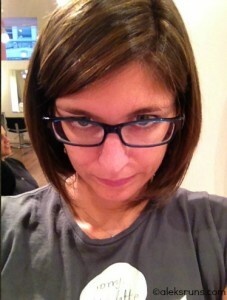 My stylist was the lovely, feisty and stylish Svetlana from Orange County. Svetlana is the manager at Salon One in Mission Viejo. Check out their Yelp reviews – pretty rad! Keepin’ it classy in ankle-length jeans (knee hole, accidental, mercifully covered by robe) and running shoes. But hey, they’re Tiffany blue! My mom got her hair highlighted, too, which was a pleasant surprise. She’d come all prepared with a gazillion books loaded on her Kindle , but since one of the hair models didn’t show up… life is tough; impromptu beautification helps! And get this. One of Svetlana’s stylists was able to work on her: a lovely lady from Bulgaria, which was uber helpful seeing how my mother speaks nary a word of English. Many thanks to Maya for making my mommy pretty! Would you like to be a hair model? If you live in the Bay Area and don’t mind spending the occasional Sunday afternoon at Di Pietro Todd, email a current picture of you and your hair along with your contact information to academy@dipietrotodd.com. Day one of LA Marathon training! I’m using the Own It: Marathon training plan from Train Like a Mother and today called for an easy 4-5 miler. The gluteus maximus felt surprisingly fine after the Saturday stairs, but I took it slow anyway and didn’t even go the full five miles. 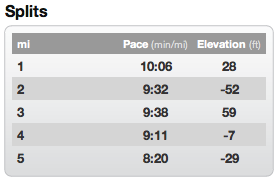 Almost* negative splits were a nice bonus. *I really wish RunKeeper had some sort of voice prompt towards the end of each split comparing it to the previous one. Something like “You are on pace to do this split 6 seconds slower than the last one” would’ve totally caused me to pick it up and score five negative splits. ← Step by Step, Ooh Baby! First, the hair is beautiful! Second, love the blue sneaks! Third, congrats on starting training–don’t forget to get regular massages. It’ll help *everything*, especially recovery between runs when you get to those longer ones. I know, yet one more discretionary spending item, but like pedis, they’re a necessity! You know, this is weird, but I hate massages for some reason! They either hurt too much (deep tissue) or just feel like someone’s slathering stinky oils on my skin. I do get them every now and then, but pedicures definitely are preferable 🙂 Oh, and foam roller and The Stick… must haves!